First let me start by saying this is not a political post, this is a post by a mediator on communication. The Streep vs Trump “battle” is fascinating to me. As are many of the other “battles” that Trump seems to find himself in. Sometimes it’s about what is being said, sometimes it’s how it’s being said, sometimes it’s the body language and sometimes it’s the platform. I heard Streep’s speech last night during the Golden Globe Awards called an attack on Trump. I watched it live and certainly didn’t get that impression. Did I feel that it was a fundamental disagreement about politics? Yes. Did I feel that it was an attack? No. I guess the first question I should ask is when is a disagreement or conflict considered an attack? When one side doesn’t like what they hear? That can’t be true or we would all be under attack all of the time. When it’s untrue? Maybe. Trump is a public figure and very vocal about his intentions, Streep seemed to focus on his agenda. Did Trump mock a person with a disability? Only Trump truly knows, however perception is often reality and actions speak louder than words. The perception is that he did, his actions have overpowered his words. When it’s personal? Probably. Streep did not offend Trump on a personal level. When there is a threat? Absolutely. I didn’t hear any threats during Streep’s speech. Unlike my mediation meetings, I had the opportunity to replay and reread both sides of this “battle” looking for things that I may have missed the first time. Streep was clear in her position – that she did not appreciate Trump’s mocking of a person with a disability to start with. She did not appreciate his stance on immigration and she was supportive of a free press. 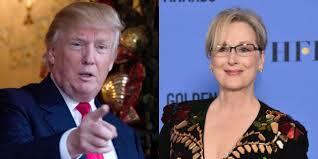 Trump was clear in his position – Streep is an over-rated actress and a Hilary flunky. In addition, he defended his position with the mockery. Streep used a platform available to her to respectfully share her opinion. We could see her body language, her passion and her authenticity. Trump used Twitter as a platform to share his opinion although I don’t feel he did it as respectfully. Twitter didn’t allow us much context. Streep shared how it personally felt to her. Trump did not share anything personal. Streep did not criticize Trump personally, however criticized his politics. Trump did criticize and his criticism is harder to define. Was calling her an over-rated actress simple a professional criticism which would balance her criticism of his politics? Maybe. Was calling her a flunky personal? I can’t see how that isn’t personal. You hear it all the time – You need to attack the problem…not the person. What is the problem here? A difference in politics? Great, that’s to be expected. Trump will encounter many more of these differences of opinion or ‘battles’ as they are being labeled based on his chosen profession. Assuming that I’m not personally offended by some of Trump’s comments, actions and behaviors (which I am but as a mediator I try really hard not to let that influence my review of the situation), at the end of the day, Trump has a communication style that is not effective with many people. Effective communication during conflict is that much harder. Trump has shown to have a communication style that is aggressive and uses deflection or avoidance when communicating. When you are in not conflict, or have a relationship as a base, you can gain the benefit of the doubt, overlook differences and make allowances for different communication styles. When you don’t have those things, modifying your communication style for it to be effective is vital. If we break communication down, it’s a connection, an exchange of information, it’s 2 way and requires feedback and interpretation by the receiver. In order for communication to be effective, we must ensure that the receiver has understood our message. When there is any misunderstanding or break in any of the above, communication ceases to be effective. It becomes just talk, it has little purpose, it doesn’t promote action and it doesn’t incite change. Whether you agree that the Golden Globes was the right venue, whether you agree with what Streep said, whether you are a Trump supporter, a Hilary supporter or don’t really care about politics at all…Streep connected with her audience, she did it without name calling or personal attacks, she did it while staying focused on her message, she gave it the time she felt it deserved and it was well thought out. The immediate response from many in my circle, “I wonder what Trump will tweet in response?”. To me that speaks volumes about Trump’s communication style and his ability to connect with those that may disagree with him. Effective communication is challenging, there is no professional in this space that will tell you differently. I do know this, you can’t force someone into your communication style and hope to have positive results. Something to think about as you finish reading…Who is most likely to have been heard last night? Streep’s calm and impassioned speech or Trump’s 3 tweet response to it?